‘Quality of life’ is a measure of citizens’ satisfaction with their lives. People’s personal values and life experiences determine their level of satisfaction. This includes health, independence, participation in community and civic activities, personal development, physical and material well-being, recreation, relationships with other people and social support. Citizens, usually, are uncomfortable with high levels of crime; insanitary conditions in the countryside and city and incivility by officials, all of which contribute to lowering the ‘quality of life.’ These conditions should not be regarded as a permanent state but as temporary problems to be solved. The State, regional administrations, the media, municipalities, trade unions and civil society can do much to enhance the quality of life, to give citizens the feeling of satisfaction and to solve the problems that affect them. Public services are essential to citizens’ ‘quality of life.’ Public services involve public trust. Citizens expect public servants to serve the public interest with integrity and reliability in order to manage public resources efficiently. Public trust encourages active citizen participation in society and the economy. It makes public agencies more accessible and more accountable. Reliable public services inspire public trust and create a favourable environment for human safety and for the functioning of businesses thereby contributing to well-functioning markets, economic growth and, consequently, a high ‘quality of life. ’ Public trust Dreams of a ‘good life’ turned into a horrible nightmare at the dawn of the new millennium. The most unforgettable experiences and most frightening evidence of our descent into chaos were the bloody, drug-driven, decade-long ‘Troubles. ’ The ‘Troubles’ will be remembered as the darkest hour in our history. It was a time of the un-investigated assassination of a Minister; of the investigation into the alleged implication of another Minister in the direction of a ‘death squad’; of the alleged implication of yet another Minister in the acquisition of a computer to track the telephone communication and location of adversaries targeted for assassination. It was a time of arbitrary arrests; of disappearances and of torture of young men; of the surge in armed robberies, narco-trafficking and gun-running. During that first, deadly decade, there were 1,317 murders and 7, 865 armed robberies. It was a time of deception and the cynical rejection of £4.9 million UK Security Sector Reform Action Plan for which a memorandum of understanding was signed in August 2007; of the rejection of recommendations of numerous security reform reports and total disregard for the implementation of the National Drug Strategy Master Plan. The evidence of the impact of the man-made criminal crisis is still visible. The damage is most manifest in the demoralisation of the public and security services, the erosion of public trust and the lowering of the ‘quality of life. ’ The grisly security situation was accompanied by a parlous economic situation. The undermining of public infrastructure by the encouragement of cronyism led to serious, costly, serial scandals as seen in the construction the Kato Secondary School; the Hope Canal bridge; the river-front revetment at Kumaka, Barabina road and Moruca bridge; Supenaam stelling and the still unusable Ministry of Social Protection building in Georgetown. The paralysis of public telecommunications became evident in the incompetent or corrupt implementation of the US$ 70 million Fibre Optic Cable Project and the misapplication of computers under the ‘One Laptop per Family’ Project. The environmental policy will be remembered, forever, but not fondly, by the administration’s responsibility for the most destructive environmental disaster in Guyana’s history — the catastrophic 2005 flood. This was an event of incalculable damage, disease, discomfort and, in some cases, death. The exaggerated emphasis on narrow elements of the Low Carbon Development Strategy obscured the absence of strategic thought and action. Guyana’s rich biodiversity, wildlife, wetlands, coastal zone, rivers were not adequately protected against the ravages of lawless logging, mining and solid waste mismanagement. Economic policy Your Government entered a depressing financial landscape in May 2015. The economic legacy that this nation inherited was characterised by a lack of strategic planning and whimsical decision-making. The absence of a policy to provide employment opportunities for youth and to reduce extreme poverty and the failure to energise the manufacturing sector weakened the economy. Economic mismanagement was accompanied by huge debts for unpaid international obligations and court judgements. The most grave financial problem was the bankruptcy of the Guyana Sugar Corporation (GUYSUCO) which owed $89 billion in debts. Your Government was forced divert money from economic development and social projects to rescue the ailing corporation with an immediate injection of $12 billion. An additional $11 billion had to be provided the next year, 2016, making a total of $23 billion bailout in 18 months. These transfers exclude the servicing of GUYSUCO's debts in respect of the Skeldon Estate Modernisation Project – a monstrous and monumental US$ 200 million mistake and, probably, Guyana’s single most costly industrial catastrophe of all time. Paddy farmers in the rice industry were not spared the previous administration’s reckless mismanagement. The PetroCaribe Fund – used to meet payments to farmers for rice and paddy shipped to Venezuela – contained less than US$1 million in May 2015. Your Government was forced to make available nearly $4 billion immediately so that poor paddy farmers could be paid. 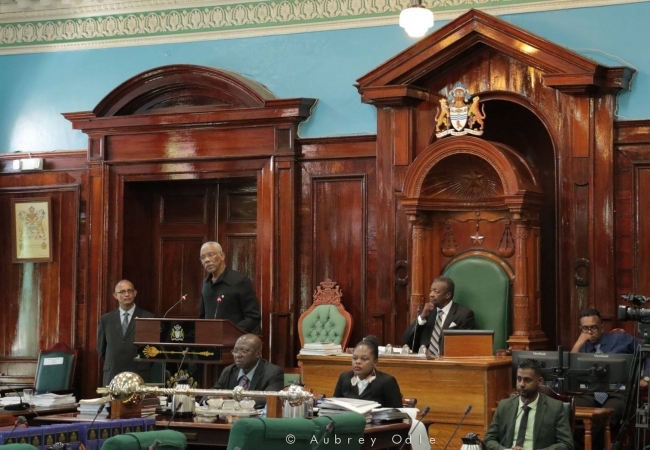 Your Government inherited a large number of liabilities, including judgements in excess of US$34 million (or G$7 billion) in favour of NH Elias, in respect of the East Bank Demerara Road; judgement for $1.3 billion in favour of Rudisa Beverages; judgement in favour of Trinidad Cement Limited; settlement for$1.4 billion with B.K. Tiwari on Haags Bosch Project and several other judgements that will cost the State over $1 billion. Your Government, also, was obliged to provide another $5.4 billion bail out the National Insurance Scheme as a consequence of the previous administration’s irresponsible CLICO investment. Your Government, despite encountering this immense mountain of debt, was able to meet commitments to the nation’s hard-working public servants. The minimum wage grew from $39,520 in May 2015, to $55,000 in January 2016, an increase of 39.2 per cent in 7 months. Public servants have benefitted, in addition, from the raising of the tax threshold, from $600,000 in May 2015 to 660,000 in January 2016; the removal of income tax from workers' contributions to the National Insurance Scheme and a tax-free payment of $50,000 to all workers earning less than $500,000, in December 2015. These benefits, taken together, augmented workers disposable income significantly. Collective bargaining with public servants’ unions could result in additional benefits in the form of increased increments, allowances and adjustments made for ‘de-bunching’. Old-age-pensions have been increased from $13,120 to $18,200 or by 38.7 per cent, and Public Assistance increased by 24 per cent during the same period, May 2015 to April 2016. Your government’s overarching objective is to ensure a ‘good life’ for all of our citizens. We have chosen a ‘green’ pathway to achieve that higher ‘quality of life’. - management of solid waste and sanitation. Guyana’s ‘green agenda’ will promote ‘green’ economic sectors such as the development of climate-resilient agriculture, ecotourism and information communications technology and promote renewable energy generation. It will ensure a diversified and resilient economy while promoting ‘green’ growth and ‘green’ employment and secure a clean and healthy environment for future generations. Your Government announced, on 1st October 2016 – National Tree Day, the establishment of the Department of the Environment within the Ministry of the Presidency. The Department will ensure more effective communication, cooperation and coordination among the agencies concerned with climate change, energy generation, environmental protection, forest conservation, national parks, protected areas, rivers and wildlife protection. The Department has been tasked with developing a master plan to achieve the objectives of the ‘green agenda’. Guyana established itself as a global leader on the environment as early as 1989. We accorded to the international community the use of 371,000 hectares of our forests – an area larger than Malta – for research into the sustainable management of forest resources. The Iwokrama International Centre for Rainforest Conservation and Development (IICRCD) remains in the vanguard of our campaign to conserve our forests, to counter the adverse effects of climate change and to conduct research into our rich biodiversity. Iwokrama will be the site, from the next financial year, for the establishment of an international institute for biodiversity. The institute will allow local, regional and international students to research out rich and diverse flora and fauna. We will set aside, also, an additional two million hectares of forests and wetlands for conservation, in accordance with the commitments we made under the Paris Agreement on climate change. Protected areas will be established in every Administrative Region of Guyana. Environmental degradation caused by reckless logging and mining remains a source of concern. We will continue the process of reclaiming mined-out areas in our country and of restoring the ecological integrity of our forested areas. Loggers and miners will be under a legal obligation to ensure sound environmental practices. Your Government will reboot the fledging ecotourism sector in 2017. Our unmatched biodiversity is a world-class product which will allow us to create a globally-competitive ecotourism sector. Public infrastructure Public infrastructure, connecting our hinterland communities to each other and to the coastland, is pivotal to the development of the ‘green’ state. Our ecotourism destinations are located in the hinterland. Infrastructure is needed to access these attractions. We will continue to advance, in 2017, initiatives for climate adaptation. A programme to bolster and better manage and maintain our sea defences will be developed with our international partners. It will form part of the matrix of measures in the 2017 National Budget. We will guard, also, against the effects of flooding by strengthening our drainage systems, particularly along the coastland. We will also counter the effects of prolonged dry weather on our wildlife by establishing protective sanctuaries for them. Your Government will intensify its improvement of aerodromes, bridges, roads and stellings in order to enhance communication between the hinterland and coastland. We will begin negotiations with national and international parties to build a bridge across the Essequibo River in 2017. We aim at improving the pace of economic development by removing bottlenecks to the implementation of infrastructural projects. Planning units will be established within ministries. National procurement procedures will be strengthened to address the institutional deficiencies which led to poor implementation and monitoring of public infrastructural projects. Public contracts are a key concern. We will seek international support to streamline our procurement systems and methodologies within Ministries and Budget agencies. A Bid Review Committee has been established and has begun work. The Public Procurement Commission will soon be brought into existence to improve the integrity of public procurement. Your Government established the Ministry of Public Telecommunications in January 2016. We are proud of having passed legislation which will allow for the further liberalization and modernization of Guyana’s telecommunication sector. We will extend telecommunication services to all ten regions. The e-governance programme will eventually network all government agencies and will facilitate efficient data-sharing between government agencies. This network will then be extended to citizens so that they can access government services online. Information communication technology (ICT) is integral to our ‘green agenda’. It will become a major driver of economic diversification. Internet connectivity of government buildings will be extended. Every government building – including airports, hospitals, markets, police stations, post offices and schools – will have access to the internet in coming years. ICT will impact positively on our educational system. We have reconfigured the One Laptop per Family (OLPF) Initiative into the One Laptop per Teacher (OLPT) Initiative in order to allow our teachers – the guardians of quality assurance in education – to be better equipped to improve educational attainment in our schools. We will continue the nationwide distribution of computers to our teachers – an initiative which commenced, appropriately, on 5th October – World Teachers Day. Your Government intends to make Guyana safe for this and future generations. We will do so not only by combatting crime and criminals but in uprooting the causes of crime and its links with transnational crime. We established a National Security Committee. We are in the process of establishing a new National Anti-Narcotics Agency (NANA) to address the mother of all crimes – the trafficking in narcotics. We will establish a new National Intelligence and Security Agency (NISA) to ensure better surveillance of our borders and coasts. We have taken a decision, also, to re-engage the United Kingdom with a view to restoring the aborted Security Sector Reform Action Plan (SSRAP). The Plan will commence soon with the arrival of experts from the United Kingdom to advise us on crafting a national security response to domestic and transnational crime – including narcotics-trafficking and gun-running. Aerial surveillance over the maritime zone over the past year led to a reduction in the incidence of piracy. We will continue to augment the Guyana Police Force’s Marine Branch. The Mounted Branch will also be expanded to enable it to conduct patrols in the savannahs and back-dams, which are not easily accessible by vehicular patrols. The Corps of Wardens will enforce the law with regard to mining, logging, hunting wildlife and trafficking in persons in the hinterland. The ‘green’ economy will require significant new local and foreign investment. We recognize the importance of human safety and a secure environment for attracting such investment. We want to protect our citizens, fisher folk, households and farmlands. Public services – including cultural development, education, health, justice, recreation, security, sport and social protection – are provided by the state. The provision of quality public services forms the basis for increased opportunities and well-being of citizens and communities. Public services must be accessible to every citizen, in every town, in every Region. No citizen should have to leave her or his Region in order to access public services. We will accelerate the decentralization of public services alongside the development of ‘capital towns’ in 2017. The provision of quality public services is associated with enhancing the ‘quality of life’ of citizens. We are mindful of the need to improve public administration to make public services more accountable, accessible and affordable. Continuous training and filling resource gaps in the public service will be integral to the process of reforming our system of public administration. We will improve the professionalism of the public service in 2017. The establishment of the Public Service Staff College will enable the training of a corps of public officials who will be better equipped to ensure quality and timely delivery of public goods and services. Attention will be paid to filling human resource deficits, particularly in our rural and hinterland regions. Your Government is committed to good governance. It is committed to reforming the Constitution. It will, in this regard, convene a Consultative Constitution Reform Commission in 2017. We have demonstrated our determination to ensure that local government elections are held. We will, without fail ensure that elections are held every three years as required by the Constitution. Citizens’ right to elect the representatives of their choice at free and regular elections will not be suspended again. Public policy will be undergirded by an inclusionary political process. The empowering of local communities through the holding of the historic local government elections of 18th March, 2016 created a platform for government to be brought closer to the people and for authority to be exercised through their own elected representatives. The derailment of public policy, marked by the previous administration’s bizarre determination not to conduct local government elections, by uprooting neighbourhood democratic councils and by imposing a perverse form of dictatorial on local government organs has been brought to an end. The previous administration’s disrespect shown to the public service by abandoning the principle of collective bargaining with the Guyana Public Service Union demoralised the Service. The arbitrary imposition of salary increases damaged the Service’s professional ethos by undermining the careers of public servants through the appointment of political permanent secretaries. Your Government’s legislative agenda, for the next year, is aimed at continuing our efforts to ensure a ‘good life’ for all. We will protect the interests of Guyanese by strengthening Guyana’s legal architecture. Your government, in this regard, is committed to promoting standards of probity in public office. We will ensure, also, that those who unlawfully expropriate state property are brought to justice. We will pursue the recovery of all stolen State assets. We will amend the Integrity Commission Act which will provide for a revised Code of Conduct for public officials, inter alia. The State Assets Recovery Bill will establish a State Asset Recovery Agency to recover State property that has been unlawfully acquired, through civil proceedings. Your government will seek, also, to improve the efficacy and efficiency of our immigration services by tabling the Immigration (Amendment) Bill to delink the Immigration Department from the Guyana Police Force. The National Registration (Amendment) Bill will guard against identity theft by allowing for inclusion of the biometrics of citizens to be recorded on their national registration cards. The justice administration system will be fortified by the promulgation of three important pieces of legislation. The Witness Protection Bill will give effect to the Caribbean Community’s Agreement Establishing the Regional Justice Protection Programme (1999) which came into force in 2006. The ‘Bill’ provides for the establishment of a programme to protect certain witnesses and other persons. The Protected Disclosures Bill, referred to as the ‘Whistleblowers Bill,’ aims at combating corruption and other wrong doing by encouraging and facilitating persons to make disclosures of improper conduct. The Deeds and Commercial Registries Authority (Amendment) Bill will provide for a change in membership of the governing board of the Deeds and Commercial Registries. Your Government will pay greater attention to safety in the aviation sector and on our roadways. The Aircraft Accident and Incident Investigation Bill will provide for the establishment of an authority to investigate aircraft accidents and incidents. A safer aviation sector will be pursued through the modernizing of civil aviation legislation and the amendment of the Cheddi Jagan International Airport Corporation Act to strengthen the airport’s executive and operational functions and capabilities. The Road Act (Amendment) Bill will place emphasis on the removal of derelict vehicles and impose weight limits. A stable industrial climate is integral to protecting the rights of our workers and ensuring an environment that is conducive to workers’ well-being. The Industrial Relations Tribunal Bill will provide, inter alia, for the establishment of an independent tribunal to settle industrial and labour disputes. Your government will amend the Marriage Act to put new procedures in place for non-nationals applying for a Special Marriage Licence. The Tobacco Control Bill will contribute to the protection of the health of our citizens. We aim at the development of a cohesive society in which confrontation is replaced by cooperation. The removal of inequalities based on geography and ethnicity will lay the foundation for a better ‘quality of life’ for everyone. We will work to reduce prejudice and violence. We will fashion a multicultural society characterized by tolerance mutual respect. The projection of our national interest abroad will ensure the protection of our interests at home. This requires a professional Foreign Service to ensure that the national interest is advanced internationally. Our principal foreign policy objective is the safeguarding our territorial integrity and sovereignty. Our diplomats will be aggressively pursuing, also, increased trade and investment. Your Government will assume the Chairmanship of the Caribbean Community in January 2017. We will use that opportunity to strengthen the pillars of regional integration and advance the development of the Caribbean Single Market and Economy (CSME). We adopted the 2030 Agenda for Sustainable Development of which the 17 Sustainable Development Goals are compatible with Guyana’s social agenda. The 2017 National Budget will reflect the harmonization of the SDGs with our national development plans, particularly in the social sector. The 2017 National Budget will be laid in this House in a few weeks time. The preparation of this Budget started several months ago and has been characterised by an inclusive and consultative process. It will be designed around a results-based format. It will be guided by the objectives of fiscal sustainability, institutional sustainability and environmental sustainability. Budget measures will include renewable energy generation and improved energy efficiency – key initiatives of our green agenda. Guyana’s future is linked to renewable energy generation and increased use of energy-efficient technologies. We will graduate our economy increasingly towards greater renewable energy use across all sectors of Guyana. Government buildings will be powered, eventually, by renewable energy sources and will utilize energy-efficient technologies. Incentives will be offered to the private sector to follow the government’s lead. - promote the increase of aromatic rice production which will add to the crop production in rice sector at a higher end of the value chain. The ‘green’ state will ensure that we bequeath to our children and grandchildren a secure and safe future and a higher ‘quality of life’. The ‘green’ pathway to development will allow for us to sustain economic growth, generate new sectors and additional jobs, build a more resilient and diversified economy, promote human development, reduce inequalities and ensure the safety, security and general well-being of our country. The discovery of large petroleum reserves in our offshore waters is an exciting development. The emergence of a petroleum sector, however, will not derail our march towards establishing a ‘green’ state. We are wedded, irrevocably, to that mission. Guyana celebrates its fiftieth anniversary of Independence this year. We are celebrating the Year of Renaissance. We owe it to future generations to use the remaining months and days of this year to build bridges across the abyss of discord. The two sides of this House have not always disagreed. They have found common ground in the pursuit of the common good at times. The avenues for compromise and consensus remain open. Guyana’s people-centered ‘green agenda’ can become a platform for increased political cooperation. Our legislative agenda is evidence of the scope for consensus. I trust that this House will consider these words and will lend its support to the goal of attaining a higher ‘quality of life’ through a ‘green’ development trajectory.